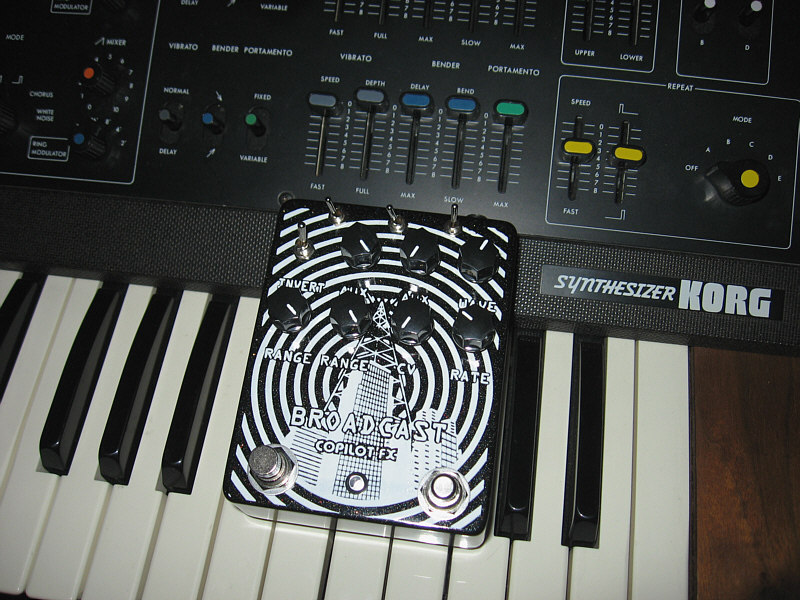 Arrow White Noise Generator, it has a bypass footswitch to turn on the white noise (when is in bypass it passes the signal, so you can use in your signal chain), the difference with the arrow airwaves is that when is on, your signal doesn't affect the effect). 2 white noise voices (one harsh, the other has a filter), CV input to control all the parameters (toggles selects if its external CV or the knobs controlling the parameter). Tesseract signal splitter and more, inside this box there are 2 FX loops (a and b) with the option to add feedback loops to each one, the result can be crossfaded with the dry signal, and a voltage starve option to power external devices. Exp/CV inputs for the feedback loops amount, the mix of the 2 loops, the crossfade section and the voltage starve. Another variation of the Broadcast, this one has 3 independent outputs (2 TRS expression outs and 1 CV out, each one has its own range knob), it also comes with Expression/CV input to control the rate/ratio or manually sweep the outs, invert toggle to have the 2 exp out be synced or unsynced. The extra footswitch changes the output from lfo to the exp/cv in for the 2 expression outs, while the cv out has a toggle. autopilot wrote: Another variation of the Broadcast, this one has 3 independent outputs (2 TRS expression outs and 1 CV out, each one has its own range knob), it also comes with Expression/CV input to control the rate/ratio or manually sweep the outs, invert toggle to have the 2 exp out be synced or unsynced. The extra footswitch changes the output from lfo to the exp/cv in for the 2 expression outs, while the cv out has a toggle. Polypus supreme this one has expression outputs of the lfo and sequencer with range knobs, instead of hi and low eq knobs. I'm blown away by its possibilities! 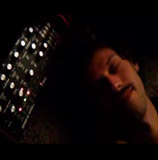 Last weekend I ran it into the expression pedal input of my BOSS DD-7 and it produced very cool (flanger!) and sometimes ultra-glitchy sounds, VERY similar to the sonic craziness of a Seppuku Kompakt Kassette. This is an awesome unit, Adam! Thanks so much! Brainzilla (this would be the 3rd version), it has 2 independent LFO and a 5 step sequencer. The LFO can be synced to the sequencer to change the speed/tap ratio via the sync toggles or not (each one has its own speed/ratio knob). CV output jack for LFO A, LFO B, and the sequencer. Footswitch for tap tempo, manual trigger or freeze the sequence (it will freeze the sequence into a specific step when you press the middle footswitch and will restart advancing when it's released), CV input sync jack to sync the tap tempo to an external beat.